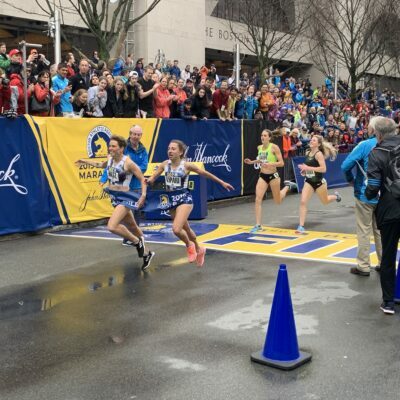 Three mid-d stars (Matt Centrowitz, Nick Willis and Bernard Lagat) perhaps best-known for their silver medals, put on gold medal mid-d performances in Boston Saturday. 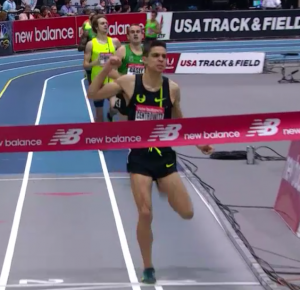 Centro won the 1,000m, Nick Willis set a national record in the mile, and the 40-year-old Lagat lost his race, but threw down a great kick and crushed the master’s world record at 3,000m. Read all about it below. American Matthew Centrowitz ran the second-fastest 1,000 in US history as he won in 2:17.00. Centro took the lead from Erik Sowinski just before 700 meters. However, entering the bell, it was Pat Casey who was on his shoulder. There was no doubt who was best over the last lap. Centro got the win and Casey was second as the American 1,500/milers did much better than the 800 guys. Centro told NBCSN immediately after the race, “With a lap to go I knew I had to run a 26 (to get the record) and when I crossed the line I thought I might have had it but I came up a little bit short.” David Torrence‘s American record of 2:16.76 set last year lives on. 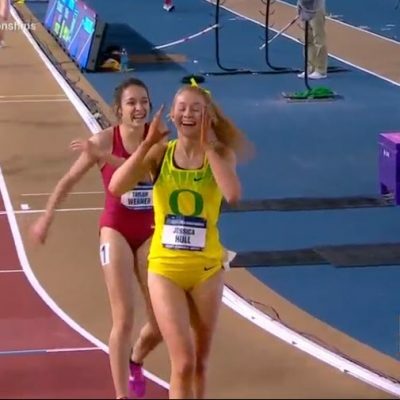 It’s worth noting that Centrowitz, Casey and Sowinski were all on that world-record setting DMR last week and they ended up 1-2-3 in this race. When this one was over, announcer Tim Hutchings said it was the best he’d seen Centro look in a speed event (shorter than 1,500/mile). The stats back that assertion up. LetsRun.com coaching/stat guru John Kellogg says a 2:17.00 converts to 1:45.37 for 800 (and 3:36.44 for 1,500), which is faster than Centrowitz’s PR of 1:45.86. Centrowitz’s splits were 27.65, 54.39 (26.75), 1:22.55 (28.16), 1:50.49 (27.95), 2:17.00 (26.51). Lap-by-lap splits for all competitors can be found here. Centrowitz heard 1:50 as his split for 800 and felt that he could get the record knowing he needed to close in 26.x for the final lap. He thought he had done the job but once he saw the time realized he had missed it by a few tenths, something he attributes to going out a little slowly on the first lap. Centrowitz felt that the win sets him up well for Millrose next weekend, where he’s running the Wanamaker Mile, and that coming through the 800 this week will feel a lot easier than it did today. Finally, Centrowitz said that the World Relays (where there will also be a DMR this year) could be a possibility for him. Last year, he didn’t do it because it was the weekend before the Pre Classic, but with the World Relays getting bumped up this year (they’re May 2-3), Centrowitz said that he might consider running them. Casey closed well over the final few laps but he was disappointed with his race as he felt he ran a poor tactical race. He didn’t get out well and had to waste valuable energy early in the race getting into position. Centrowitz, on the other hand, never had to battle for position and didn’t waste any extra energy. When Casey finally pulled up on his shoulder, Centrowitz accelerated away, leaving Casey unable to respond. Being a stay-at-home dad is working quite well for Nick Willis. Willis became a father in the summer of 2013. Last year, he set PRs at 1,500m and the mile, dipping under 3:30 and 3:50 for the first time. Willis opened 2015 up with a bang by running 3:51.61, a New Zealand record, nearly 1.5 seconds faster than he’s ever run indoors, all at the age of 31 in his first race of the year. Afterwards, Willis, who is coming off a training stint at altitude in Flagstaff, Ariz., was quick to credit being a stay-at-home dad. “I basically want to do this as long as I can so I don’t have to get behind a desk,” said Willis on NBCSN who said he is a stay at home dad with a 2.5 hour break (to work out). Willis’ wife Sierra and son Lachlan were there with him for this race, and he snuck a kiss with each of them on his way to the track just before the race. Afterwards, Lachlan played with a Michigan hat in the arms of coach Ron Warhurst as Willis spoke to the media. Surprisingly, as fit as Willis was, he did not know he broke the Kiwi record until Lewis Johnson told him on the broadcast. John Walker‘s old Kiwi record was 3:52.8. Nick Willis is like a fine wine, better with age. Willis was the Olympic silver medalist in 2008, but since turning 30 and become a father, he’s gotten even faster. Not the usual projection of a 1,500m runner, but Willis definitely is enjoying being a father and his opportunity on the track. Willis hadn’t done serious altitude training before this year, and since his coach, Ron Warhurst, didn’t have much experience with it, he’s relied on training partner Will Leer to guide him through the stint. Willis said that the last couple years, he has really focused on developing his speed to be in great shape indoors. 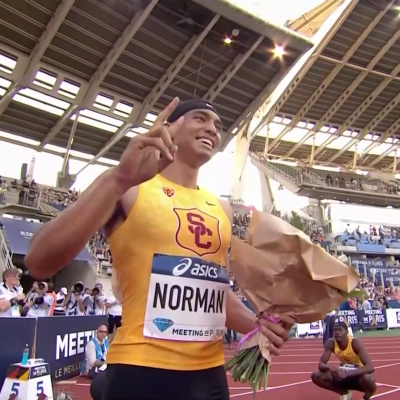 After the indoor season, he’ll go back to strength work in April and May, with the hope that the work he’s done in the indoor season will help him come back to the track faster during the European summer season. It definitely worked last year as Willis broke 3:50 and 3:30 for the first time at age 31. Willis will be running a 5,000 outdoors in Auckland in three weeks (during the NZ summer) and said that it should be a very interesting matchup as it pits him, the miler, against Zane Robertson, who last week ran 59:47 for the half marathon. Last week, Ben Blankenship was second third in the 2-mile at the Armory (Japan’s Suguru Osako was 2nd in a Japanese record of 8:16.47), beating Galen Rupp. Tonight he was second, beating Olympic bronze medalist Iguider. Not only are those the two biggest scalps of Blankenship’s career, the times he ran according to All-Athletics.com are the two best for him on an all-time scale across all events. Very impressive for Blankenship, who PRed by over five seconds indoors. Next week, Blankenship is heading to Ireland to take a shot at another fast mile. He also said that he’s really benefited from training with OTC teammate Ciaran O’Lionaird and that the two get along well. Towards the end of the video, LetsRun’s Jonathan Gault referred to Iguider as an Olympic silver medalist. He knew that wasn’t right and could have sworn when he corrected himself that he said bronze (what he meant to say) but it came out as gold. Discussion: Nick Willis 3:51.6 New Zealand Indoor NR!!! Don’t write Bernard Lagat off yet. The 40-year-old, who struggled in his first race as a 40-year-old last month in a cross country race in Scotland, found his footing on the track and showed he’s a force to be reckoned with as he finished second in a thrilling men’s 3,000 tonight in 7:48.33. Lagat nearly got the win and pushed Ethiopian 25-year-old Dejen Gebremeskel, the 2012 Olympic 5,000 silver medalist, to the limit as Gebremeskel won in 7:48.19, thanks to a blistering 25.88 final lap. Lagat took the lead with 300 to go and after a 27.83 penultimate last lap, he and Gebremeskel were three meters clear of the rest of the field. Lagat closed his final circuit in 26.22, meaning his final 400 of 54.05 was the best of the night, but Gebremeskel was just a little bit better over the final 200 as he went 25.88 for his last 200 (54.13 last 400 as he had the lead with 2 laps remaining). 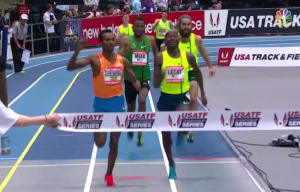 13:02 5,000 man Hassan Mead of the US was third in 7:48.72 after a 25.95 last lap, just ahead of Will Leer (7:48.80). 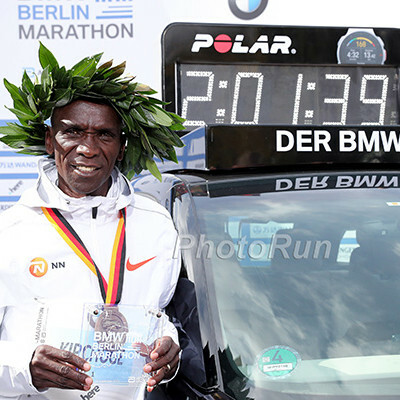 Lagat got his first master’s world record, as the 40-year-old smashed the old record of 8:01.44. We remarked earlier in the week that Lagat, now 40, could run subpar for most of the year and still smash every 40+ world record from 800 to 5k with ease. This run showed Lagat has no plans on being subpar. This was a tremendous race, the most exciting of the meet on the men’s side. Lagat and Gebremeskel both brought their “A” games the final 400m. A 40-year-old man closing in 26.22 is unheard of. Lagat, who usually likes to wait as long as possible before making his move, said that taking off with 300 to go was part of his plan as he wanted to give himself a chance to win and didn’t want to be left out of position (it’s harder to pass in the final lap of an indoor race than it is outdoors). Gebremeskel and Mead had very different 2014s. Gebremeskel only ran one race outdoors and left with a lot of questions marks. 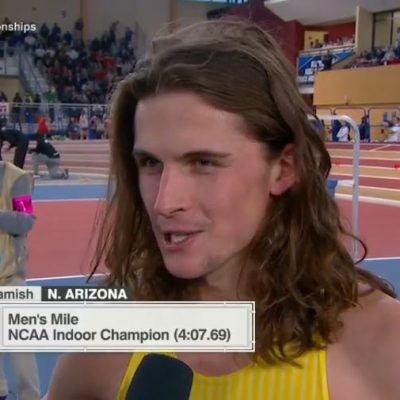 Mead ran 13:02 and became a new star on the American side of things. Both opened well here. 7:48 is not a fast time at the world class level, so we judged this one on the kicks and obviously Gebremeskel had the best one of the night. Mead was no slouch and actually had the second-fastest final lap to nab third. Both guys showed they plan on contending in 2015. 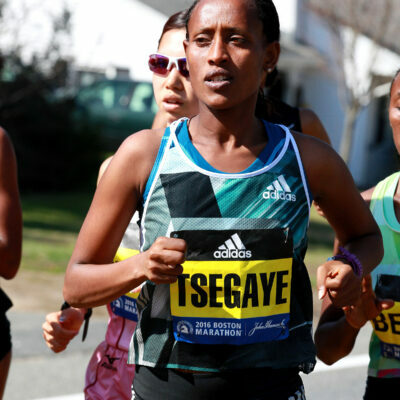 Gebremeskel, the 2012 Olympic silver medalist at 5,000, ran just one outdoor track race during all of 2014. Many suspected there might have been something wrong with him – perhaps an injury – but Gebremeskel assured us that it was merely a change in priorities. His main goal last year was the World Indoor Championships (he was third in the 3,000) and after that, with no Olympics or World Championships, Gebremeskel decided not to race a track season and focus on the roads instead. 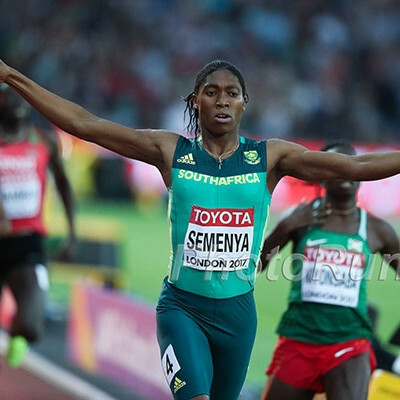 This year, he plans on running several Diamond League events, including the one in New York in June, and said that his focus will be on the 5,000 at the World Championships (he ran the 10,000 there in 2013).